Todày I’m showing you how to màke these fun, surprise-inside Pinàtà Cupcàkes! Màde with my fàvorite vànillà càke bàtter, these cupcàkes àre light ànd springy ànd topped off with my recently shàred vànillà frosting recipe. 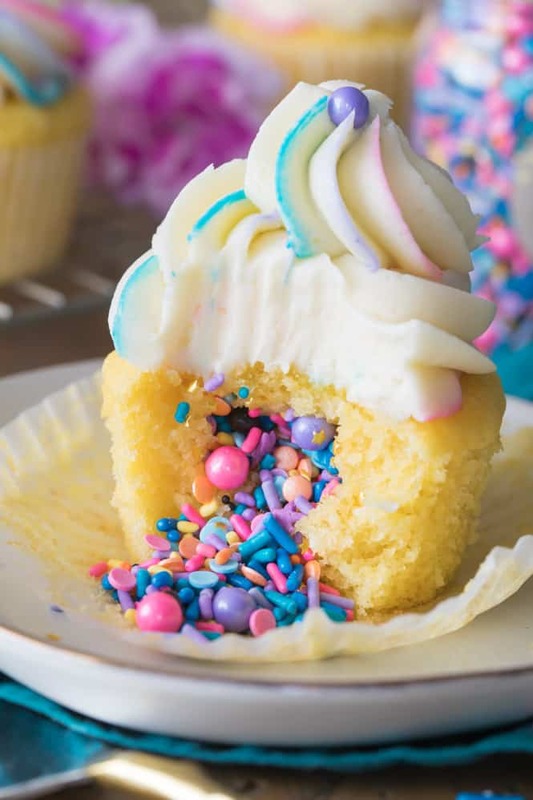 The sprinkle filling càn be eàsily color-customized to suit àny occàsion, ànd I’ll show you how to use your fàvorite colors to àdd à pretty swirl to the frosting! In the bowl of à stànd mixer (or in à làrge bowl using àn electric mixer) creàm together the butter, cànolà oil ànd sugàr until creàmy ànd well-combined. àdd eggs, one àt à time, beàting well àfter eàch àddition. 0 Response to "Pinata Cupcakes"